Below is the piece I wrote for Owen’s funeral, which was read aloud by our dear friend, Jen Weiser. Jen was one of Owen’s first caregivers and the first person, possibly even before me, to delight in Owen’s absurd and wonderful ways. Owen provided light and goodness to all those around him. He graced us with the gift of his smile, his laugh and his wide-eyed gaze. His effect was so profound, it is easy to imagine that he was heaven-sent for the sole purpose of bringing love to us earth-bound mortals. There is no doubt: his energy was generous and loving and all encompassing – his value to this world is not to be underestimated. But as I contemplate this thought, the circle of Owen’s life now complete, I know that there is much more to his story than this. Owen came with immense challenges. Throughout his entire life, he was impossibly – sometimes unbearably – vulnerable and needy. Was he this way solely for our benefit? Surely there are easier ways for a soul to spread love in the world. I believe he came as he did because he was on his own path of discovery, growth and healing. To only see him as an angel sent from above is to possibly miss the entire point of his life. Perhaps his brilliant light shone because Michael and I chose to expose him to the world, love him completely, and not hide him away – and this community responded by looking – by holding our son in its compassionate, loving gaze. Maybe this is what he came for – to fulfill his soul’s need to be seen and loved, broken body and all. Perhaps his karmic need to be loved was so great that there was no option but to arrive in the body he did. If this is the case then the value of Owen’s life is realized not in spite of his disabilities, but because of them. 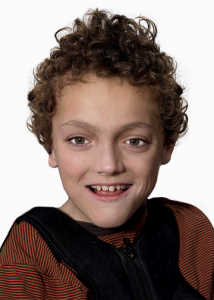 Owen came to us, in his perfect broken state, seeking unconditional love and care. Your profound expressions of love and compassion, every day of his life, showed him he was worthy – giving him the lightness to smile back and say thank you. Owen could have remained invisible, as so many like him are. Instead, we loved him deeply – and because of this I believe he returns home fulfilled and whole. who are in contact with them to accept the reality of death. love. Is this not a wonderful offering? may my love soothe your cold. 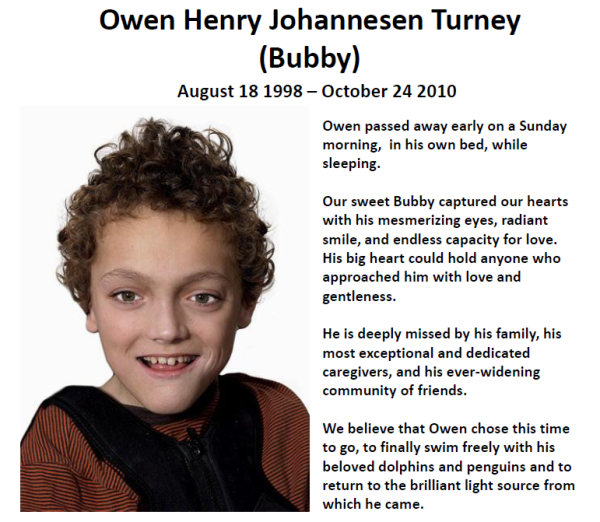 Thank you Jennifer, for sharing this tribute to Owen, and to allow those of us that couldn’t be there to feel a part of the celebration that was Owen. The picture is amazing, your tribute so touching….and I understand and believe you are completely right. Ironically, I’m sitting here trying to word a card for you…but words seem so empty. In the year and a half of trying to source out the reason for Shane leaving when he did, I’ve come the the exact same conclusion as you…he was gifted to me for a time…we had an agreement beyond our earthly understanding…that he would gain the opportunity to be loved completely for who he was as he was, and I would learn the lessons I needed to in acceptance, compassion…and being able to love unconditionally. When the lessons were learned, he was free to go…as was Owen. In the time since his passing, I’ve learned he is still very much around and part of all that I am and all that I see. A dolphin reminds me of my dolphin boy (and they seem to be everywhere it seems…) ….an eagle overhead tells me he is watching over me from his new vantage point….and the passing of a butterfly tells me that change can be beautiful…that the spirits of those who have left us carry on in a beautiful new way….understandings that have made it bearable, and possible for me to carry on each new day. May time gradually ease what you’re going through today, although to say it will take the pain away would be wrong. It will just make it managable, as you find your way in this new world, forever changed, but forever blessed by the essence of Owen….and if there’s anything I can do…you know where I am. Take good care. Sending condolences across the miles…. Jennifer, I only had the opprortunity of meeting Owen and becoming aware of the challenges this little boy with light in his eyes, and and a smile on his heart, for a brief two hour period, while visiting Daina a year ago. I have to say I felt such sadness when I heard that he had passed away but yet I see him free – free of his disabilities and the challenge to remain brave obviously through his life. Having a devoted mother such as yourself, as well as the love of his father and darling brother, no doubt gave him much happiness. I only knew him for a short time but he did leave a foot print on my heart. You have expressed your thoughts and a done an amazing job of documenting his ilfe etc. and I wanted you to know that. Please accept my heart-felt sympathy for you and your family’s loss. Jennifer I wish we had had the chance to gain a little more knowledge together about our children but the words you have used to describe Owen’s purpose and meaning are words that I thought I would find one day for Segev–you beat me to the punch–your words really hit me hard–there is understanding there that I suppose one only gets from a kind of closure. The only thing that I can do is sit back for a moment and soak in your healing words. It is going to make the journey just a little bit easier for me and hopefully that will rub off on Segev as well, despite my sadness for you having to see Owen move on. 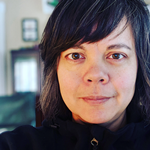 I don’t know you and never had the privilege of meeting your Owen beyond the beautiful words you use to describe him and the photos you post, so I thank you for moving me nearly beyond words with this post. I often think about the possible death of my daughter, the what ifs, the worries — please know that your words touch and heal a part of me. It is all love. I send you peace and courage and strength as you mourn. It was with great sadness that I heard about the death of Owen in the bodily form that we were familiar with. I totally resonated with the words you wrote about Owen, even though I only met him briefly once. He really lived his purpose as did those around him. We are all better because of his presence. I also know how painful it must be to not be able to hug and kiss him in the same way as before and yet, I am sure he makes his spirit felt often. My heartfelt prayers are with you and Owen’s family and world of friends/supporters as you move through this transition time. Namaste and one with you in the deep mystery.